I’ve failed at every Bible reading plan I ever tried. I’ve tried The Chronological method. 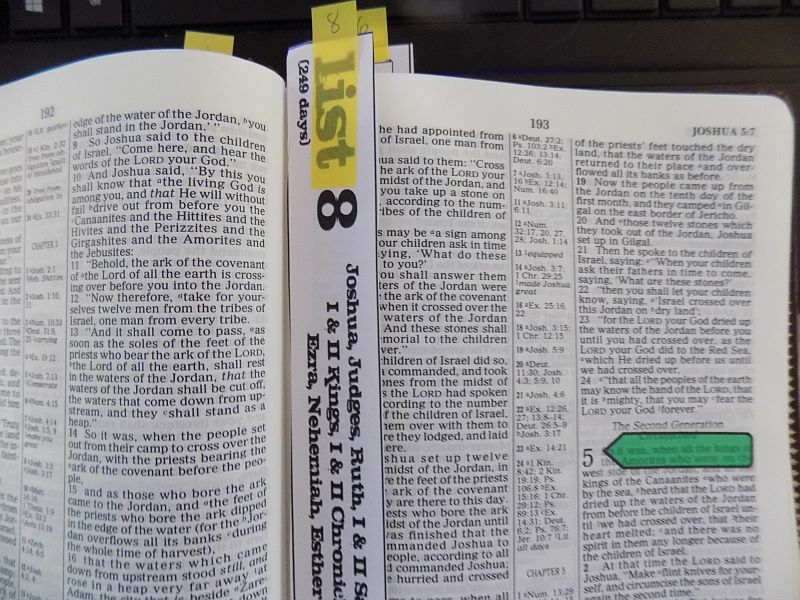 I’ve tried ‘read the Bible in 90 days’. I’ve tried the audible, listening to Max McLean read Robert Murray M’Cheyene’s plan. I’ve tried the Five Day reading Plan. I’ve abandoned them all. But now I found Grant Horner’s Bible reading system and I just love it. Rather than talk myself into reading every day, I can’t wait to read every day. I adore the way it’s set up. Here is Tim Challies introducing the system. He had spent the first paragraphs explaining his own previous unsuccessful attempts to stick with a plan, too. It’s unique among the systems I’ve attempted in that it requires more reading and yet somehow makes all that reading seem so much easier, enjoyable and attainable. Yes. I have found this to be true. The system is quite simple–every day you read ten chapters of the Bible. That seems like a lot, so stick with me as I explain it. Each of the ten chapters will be from different books, which is to say that at any given time you’ll be reading ten books of the Bible concurrently, one chapter per day. So on day one of the system you will reading the first chapter of Matthew, Genesis, Romans, 1 Thessalonians, Job, Psalms, Proverbs, Joshua, Isaiah and Acts. You will read each of these books, one chapter per day, and then go on to other books before repeating it all again. This means that every year you’ll read through all the Gospels four times, the Pentateuch twice, Paul’s letters 4-5 times each, the Old Testament wisdom literature six times, all the Psalms at least twice, all the Proverbs as well as Acts a dozen times, and all the way through the Old Testament History and Prophetic books about 1 1⁄2 times. Scripture begins to interpret scripture. You don’t need the deep-study while reading on this plan because the volume and variety of readings you do each day begin to knit together of themselves. You can deep-study at another time, but if your goal is to read the Bible through, despite the seeming length of material expected to be read daily, this Bible plan is excellent. After just a few days the reading gets much easier; in a month it will be a habit, and in six months you’ll wonder how you ever survived before on such a slim diet of the WORD. And then — you’ll tell others to start the system! Stay somewhere between speed reading and deep meditation. Get through the text without dawdling, looking up cross-references and so on. Get to know the Bible and these things will explain themselves. Stick with one Bible, not just one translation, but one actual Bible. 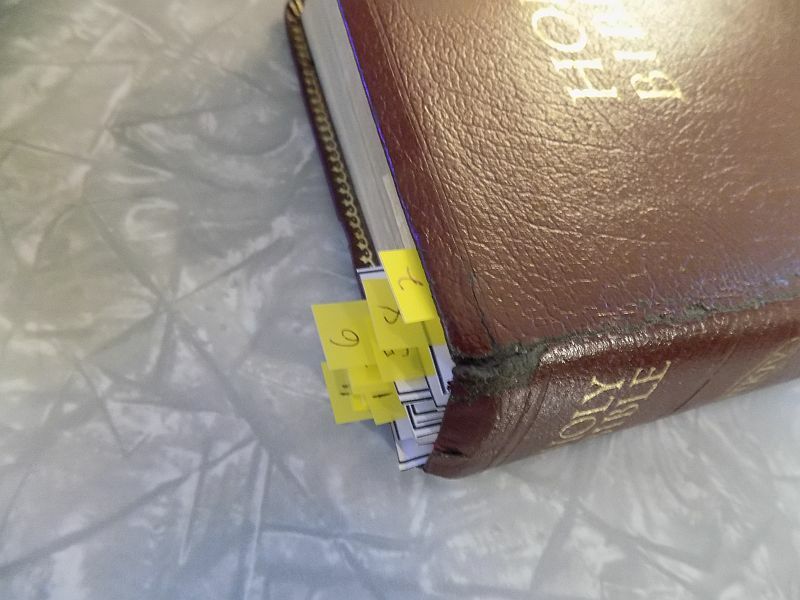 I would try to ensure it’s a printed Bible, not an electronic one. Read in the order he suggests, which means you’ll be moving from Old Testament to New and back again several times every day. Don’t be legalistic. If you miss a day, pick up and keep going. Don’t quit. 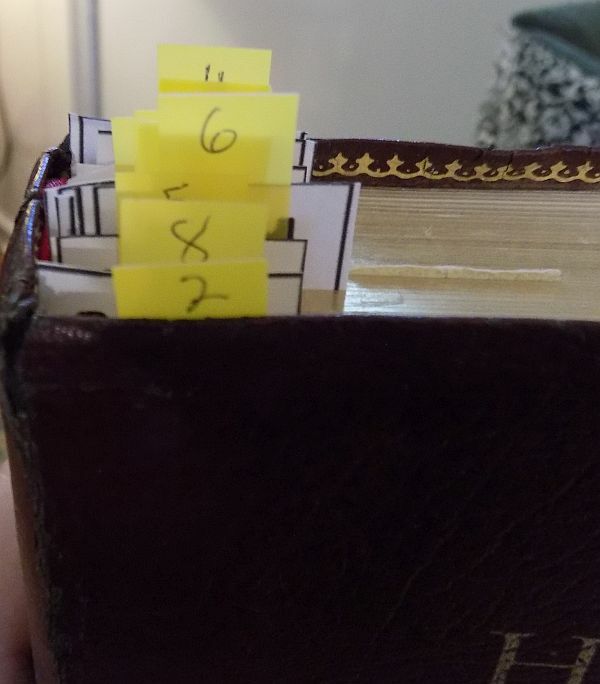 Since not all the chapters are the same length, and on Day 15 you won’t necessarily be on chapter 15 of all the books, I also use a post-it tab to show me where to begin each day. One thing I like about this plan is that once I printed out the bookmarks and put the tabs on them I was done with organizing. (5 min) There is no paperwork or fussiness to this plan. I have small note papers next to my laptop. Even though the plan demands you read at a regular reading pace, I do have questions as I read, make comparisons, draw insights. If necessary, I stop very briefly to jot them down on a small paper. It’s small so I won’t interrupt my reading for very long, just a quick note to follow up later. That’s it! Last time I write about beginning a Plan and then abandoning it, someone had suggested in the comments that I try the Horner plan. Well I finally did! Thanks readers! Here is a link to printouts of different styles of bookmarks, the bookmarks help you keep track. Sunny Shell reviews Horner’s Bible Reading plan. Is America ‘called 2 fall’ on our faces as it says in 2 Chronicles? There’s an app called Bible 10 that goes with it. I think it’s $1.99, but well worth it. I started this system in October. I agree – there’s no turning back to other methods! I actually bought a reader version Bible, with no verse numbers. It reads much smoother for me that way. “Holding fast the word of life, so that in the day of Christ I will have reason to glory because I did not run in vain nor toil in vain.” Philippians 2:16. Good morning! Max McLean sure has a wonderful voice. I did enjoy hearing it read aloud. Sometimes I listen to Spurgeon’s devotional rather than read it. It makes a difference hearing it aloud, doesn’t it?! 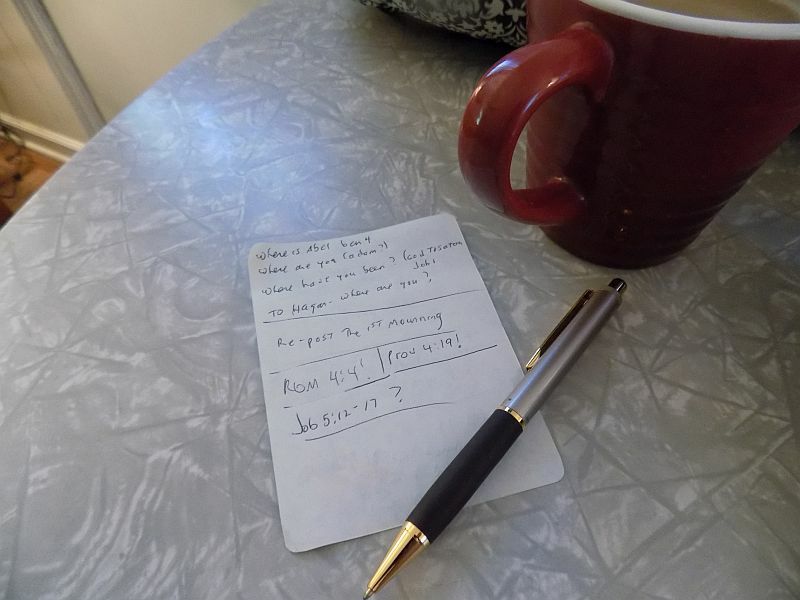 The things you mention that you like about the plan (reading several books at a time, scripture begins to interpret scripture) are benefits I have found with the free MacArthur daily reading plan as well. In it, you read OT, psalms, proverbs, and NT every day. super! I thought he only had the devotionals. Cool.